Property Signs is a broad group of signs that could be used by any property owner. 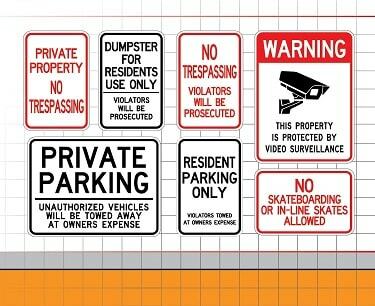 This would include parking signs, security signs, trespassing signs and any type of custom signs. All property signs are made with the highest quality .080 aluminum, coated with the industries best 3M or Avery reflective sheeting and printed to last beyond the sheeting warranty. Owners of properties can have many signage needs. Anything form where and what to do with garbage, where and when to park, how and when to enter a building, leasing information, you name it and we have made a sign for it. 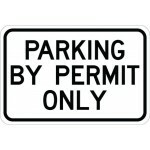 Traffic Sign Corporation can help you with standard and custom property signs of all kinds. Please order on line or call or friendly and helpful staff and let us help you. Call, Email of Fax your sign ideas. We will design it and send you a proof. Add a log, artwork or request a special color at no extra charge. We will help you choose the right material for your custom property signs. Temporary or permanent, reflective or non reflective we can help you save money and get the quality property signs you are looking for.